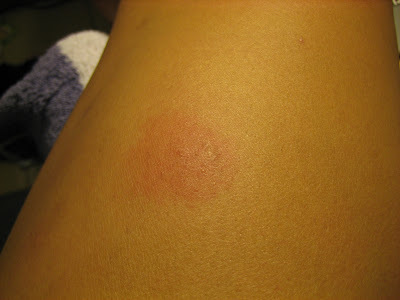 Goddamned, cursed mosquitoes from hell. I thought I'd witnessed the worst of bloodsucking insect hell while abroad in Costa Rica. But these Taiwanese mosquitoes are feasting, and feisty. 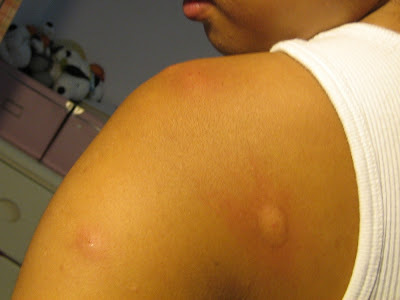 My reaction to them is an all-time high, and they are now officially right under chiggers (ok, and those Goddamned sand flies) as the most painful and annoying insects I have ever experienced. (note: I hear Bullet ants top that list). I know, I know, the ick factor is high today. And, on that note, it's a-thunderin' outside, pouring buckets, cats, and dogs. I'm starting classes at NTNU tomorrow, and heading to Tainan for the weekend to celebrate my 21st with el padre. Oh, and I'm still looking for cheap apartments around NTNU. I'm done damning insects for today.